Add 1/2 cup flour to yeast mixture and beat at medium speed until combined. Add whole eggs, yolk, vanilla, salt, and remaining 1/2 cup sugar and beat until combined. Reduce speed to low, then mix in remaining 2 3/4 cups flour, about 1/2 cup at a time. Increase speed to medium, then beat in butter, a few pieces at a time, and continue to beat until dough is shiny and forms strands from paddle to bowl (the dough will be very soft and sticky). Scrape dough into a lightly oiled bowl and cover bowl with plastic wrap. Let dough rise in a draft-free place at warm room temperature until doubled in bulk, 1 1/2 to 2 hours (I sit my bowl on top of a big pot filled with hot tap water at the bottom of the pot– just be sure the water doesn’t touch the dough bowl). 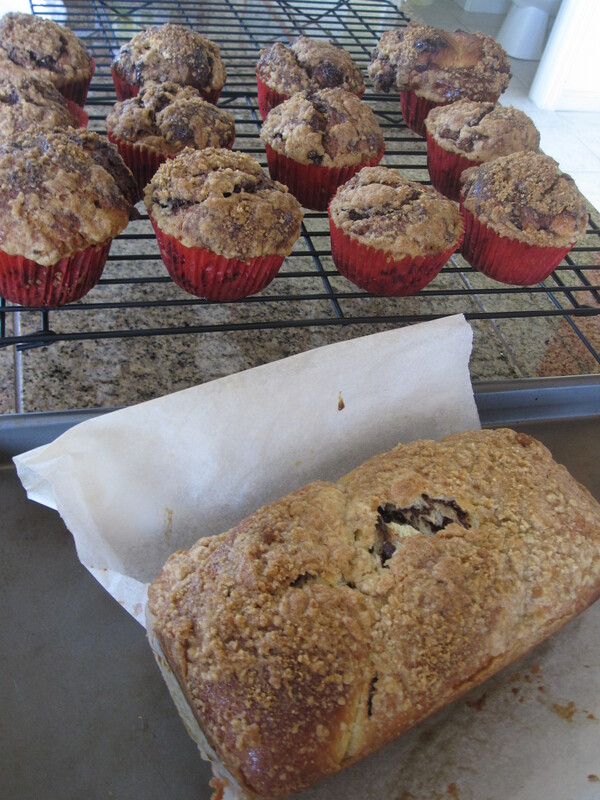 Line loaf pan with 2 pieces of parchment paper (1 lengthwise and 1 crosswise), and liner for muffin pans. Punch down dough with a lightly oiled rubber spatula, then divide the dough into 1/3 (for loaf pan) and 2/3 (for 12 muffin molds) portion. 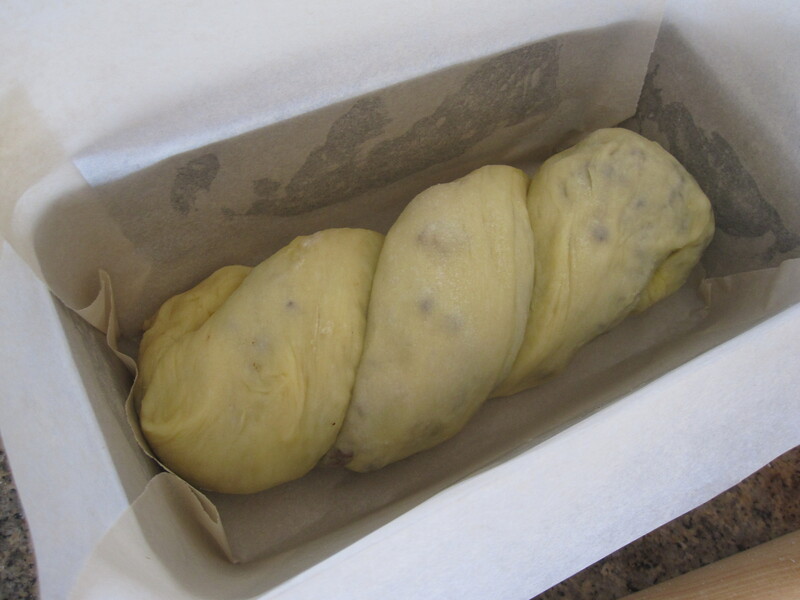 For loaf pan: Roll out 1/3 of dough on a well-floured surface with a lightly floured rolling pin into a 13×10 inch rectangle, with the long side in front of you. Brush egg wash on the long side farthest from you. Dust cocoa powder evenly over the dough, leaving a 1/2 inch space all around. Spread remaining 1/3 of the chocolate filling evenly on top of cocoa powder. Starting from the long side nearest to you, roll up the dough tightly like a jelly roll. Pinch firmly along egg-wash side to seal. Bring ends of log together to form a ring, pinching to seal. Twist entire ring twice to form a double figure 8 and fit into lined loaf pan. For muffin pans: Roll remaining 2/3 of dough on a well-floured surface with a lightly floured rolling pin into a 15×10 inch rectangle, with the long side in front of you. Brush egg wash on the long side farthest from you. Dust cocoa powder evenly over the dough, leaving a 1/2 inch space all around. Spread remaining 2/3 of the chocolate filling evenly on top of cocoa powder. Starting from the long side nearest to you, roll up the dough tightly like a jelly roll. Pinch firmly along egg-wash side to seal. Divide dough log into 12 even pieces. Take a piece of dough, hold it with one hand and twist the dough with the other hand (so it looks like a cinnamon twist). 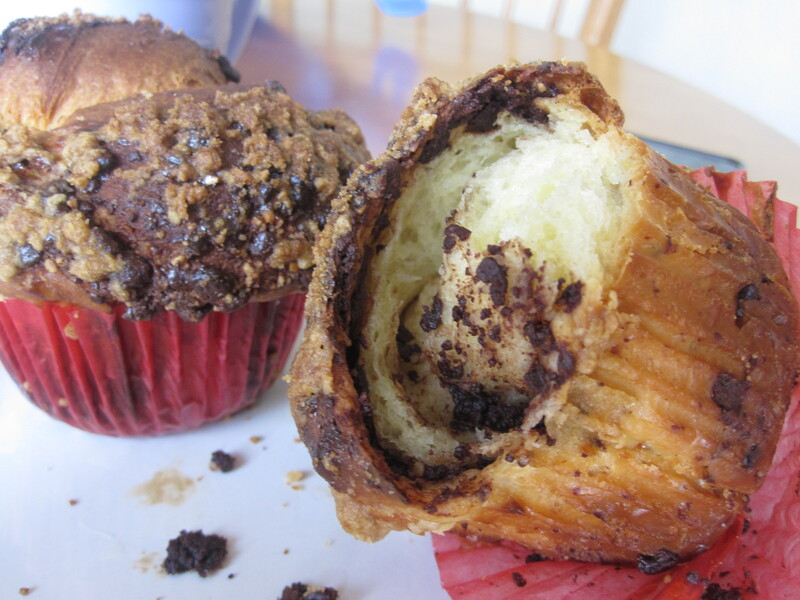 Carefully place the dough into lined muffin mold. Repeat with remaining pieces of dough. Put oven rack in middle position and preheat oven to 350°F. Meanwhile, prepare streusel. Brush tops of dough with remaining egg wash. Scoop some streusel topping on the top. Bake until tops are deep golden brown and bottoms sound hollow when tapped (when loaves are removed from pans), about 35-40 minutes. Transfer loaves to a rack and cool to room temperature (please note muffin pans take a little less time to bake). Bittersweet chocolate: it’s better to use good quality chocolate for this recipe. Also, use a food processor for the chopping– just be sure to freeze the chocolate and blade before chopping. 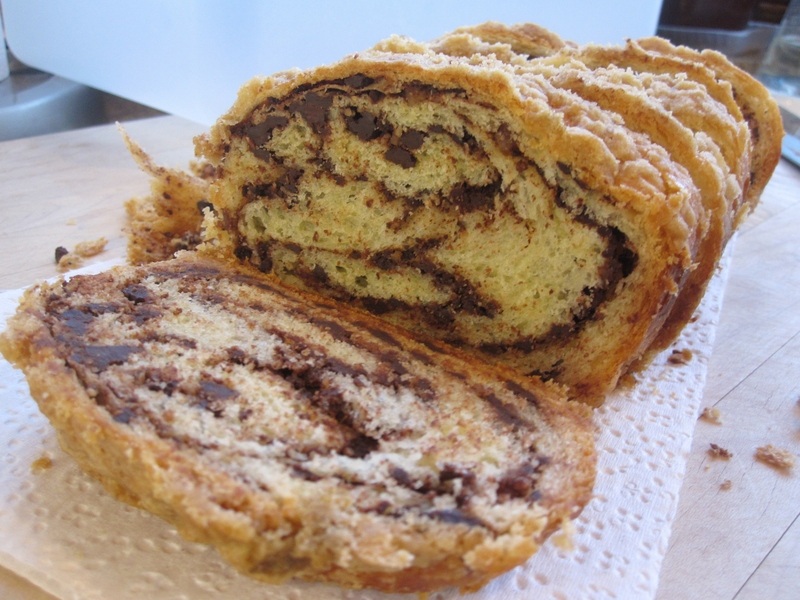 Babka tastes best when warm, reheat in toaster or toaster oven when it is cold. According to Martha Stewart, unbaked babka can be frozen for up to 1 month. After 2nd rise in the pan, wrap the pan with plastic wrap, followed by foil. When ready to bake, remove from freezer; let stand at room temperature for about 5 hours, and bake. 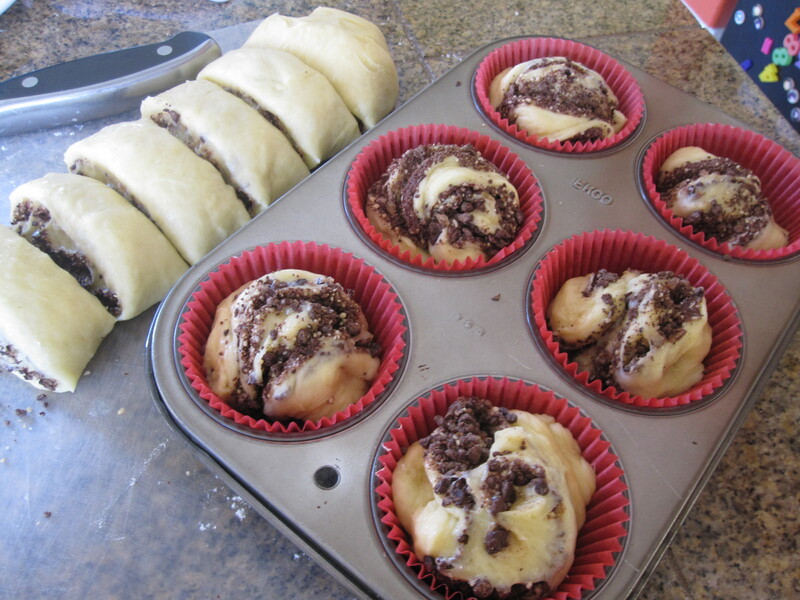 Alternatively, this recipe yields 2 loaf pans– I don’t have second loaf pan so I used muffin pans.